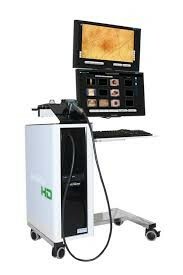 We use “ MoleMax HD” for keeping digital imaging records of your moles and also total body photography. The special camera allows up to 30 X magnification and looks through the top layers of the skin when analysing a mole and stores the images on its database. This technology enables us to detect subtle changes in moles and new moles can be identified over time leading to early detection of melanoma and therefore a better chance of cure.